I had such an incredible time talking to a packed house at one of my favorite bookstores, Kramerbooks, in my old stomping ground of DC last week. It was a special honor to be interviewed by the extraordinary best-selling author, Jennifer Close. Thank you to all the old friends and new readers who showed up! There's a little wrap-up of the reading and party from POLITICO here. I had so much fun doing this interview with BookReporter! Thanks to the fabulous lifestyle site Brit + Co for inclusion on this list! Ann Hood and Amy Schumer is some great company. Thanks to The Charlotte Observer for this kind little preview. I love seeing the Cli-Fi term taking off out in the world! Thank you thank you thank you to Redbook Magazine for including WE ARE UNPREPARED in this list of the best new books for fall. I'm in amazing company here with Ann Patchett, Jodi Picoult, Amy Schumer and many others! See the full list here. Publishers Weekly Hot Fall Books of 2016! WE ARE UNPREPARED made the Literary Fiction list in PW's index of the most anticipated titles for fall! There are so many books here that I want to read, including works from Michael Chabon, Jonathan Safran Foer, and Zadie Smith. Exciting momentum as release day approaches. 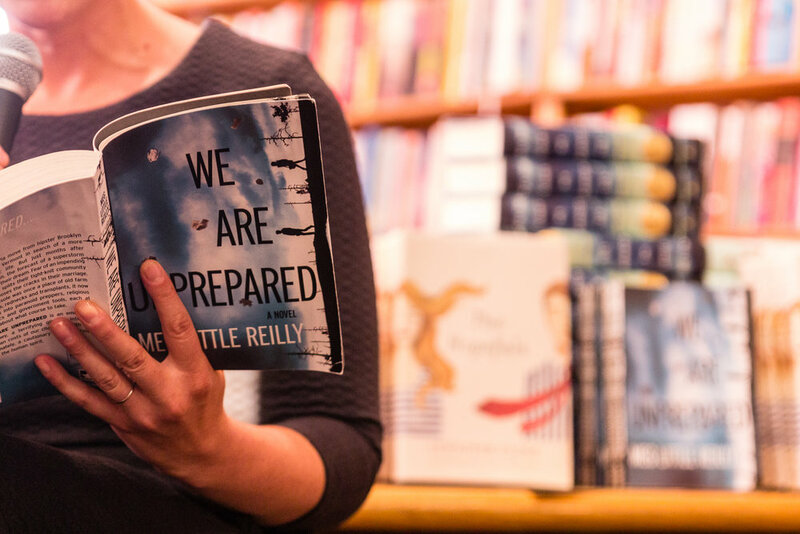 Library Journal Calls 'We Are Unprepared' a Book In Demand! In this little write-up of the 2016 BookExpo America, Library Journal details the books that moved like hotcakes, including 'We Are Unprepared' and titles from Richard Russo, Terry McMillan, and others... Read it all here. I was honored to have a feature in Show Daily, which is Publishers Weekly's big fat newspaper produced exclusively for the crowd at Book Expo America. BEA was an extraordinary opportunity to meet new readers, sign advance copies, and connect with other authors. Thank you Chicago! Very excited to be a Buzz Book of 2016! We Are Unprepared is in great company here among new releases from Ann Patchett, Mary Kubica, Chuck Klosterman and many more. "MEG REILLY ACTUALLY DID WHAT YOU KEEP SAYING YOU WILL - Ryan Grim: “Former OMB and Treasury Department flack Meg Little Reilly did it: She quit Washington, moved to Vermont, and wrote a novel. Then she got it published. By a real publisher. And now it’s been picked up by Target’s book club. It’s called We Are Unprepared and it appears to be about a superstorm and a love story, or some such. More on that book here, but that’s besides the point. She did it." There are no words for how honored I am to learn that We Are Unprepared has been selected as a Target Book Club pick. I can't be coy about it: this is kind of a big deal. The Target Book Club is a small, thoughtfully curated collection of new and old books for people who love reading. I admit that I didn't know much about it until now, but many of the books I've loved have been members of this club like Ann Patchett's State of Wonder, Erin Morgenstern's Night Circus and others. It's pretty awesome. A Cli-Fi List... and we're on it! In this short "Cli-Fi: An Introduction" list, WE ARE UNPREPARED somehow ranks among the greats like Barbara Kingsolver, Margaret Atwood and Ian McEwan! "Dotted throughout these epochs are the voices that offer insight and perspective on humanity’s greatest (and worst) achievements, from war, civil rights, invention and exploration to expositions on where this all might take us… The late twentieth century brought us a new legacy: man-made climate change. It is arguably the biggest threat to the diversity of life on earth as we know it... And it is something that wordsmiths are not able to ignore, igniting the birth of Cli-Fi, a genre that casts climate change as a main protagonist and responds to the climate crisis with a deft mixture of art, politics and sharp warning from the points of view of both activist and passive observer." Read it all over at Book Clubbish. Early review: "Reilly pulls off a virtuoso feat." "It's cli-fi, that's for sure, and it's a dystopian apocalyptic tale as well, but it ends on a note of hope and optimism. We are in uncharted territory, and Reilly gives us one heckuva ride." Thanks to Library Journal for this sweet little preview! I had such a great time at the ABA Winter Institute in Denver this week! It was three thrilling days of communing with independent booksellers from around the world. The enthusiasm and commitment this group has for the world of books is absolutely infectious. Also, they know how to party. I was honored to join about 100 other authors to discuss my forthcoming book and start planning my tour. The state of the written word is strong and we have these guys to thank for it! I had a blast signing advance copies of WE ARE UNPREPARED at the American Library Association Midwinter Conference in Boston this weekend. Lots of love and insight from librarians, teachers, book bloggers and enthusiastic readers who flew in from around the country. Best of all: answering questions from the Book Buzz stage about the role that fiction and art can play in advancing climate policy. Nice little preview in the fabulous Book Clubbish! It's surprisingly thrilling to hold it in my hand, typos and all.